The biggest thing on investors' minds lately are interest rates, and this week offers a peek into where they're heading. Most investors expect rates to rise in 2015. An increase before that could rattle markets or even stunt economic growth, but waiting too long to raise rates could cause bubbles. It's a tough call. The Federal Reserve's Open Markets Committee meets Tuesday and Wednesday, and Fed chief Janet Yellen will speak afterward at a press conference. Nobody thinks the Fed will change much at this meeting, so all eyes are on the future. It's all about what Yellen has to say and connecting the dots. Reading between the dots: The economic version of a straw poll is the dot plot. Every quarter, members of the Fed board place their vote -- a dot -- on where they expect the key interest rate to be at the end of 2014, the end of 2015 and the end of 2016. "I think that'll be a new parlor game, figuring out the dots," said John Canally, investment strategist at LPL Financial. The more important thing for investors to watch, he said, is Yellen's tone during her press conference, which has tremendous sway on the markets. In March the stock market freaked out when she off-handedly said the Fed might raise rates six months or so after the end of its bond-buying program is over. 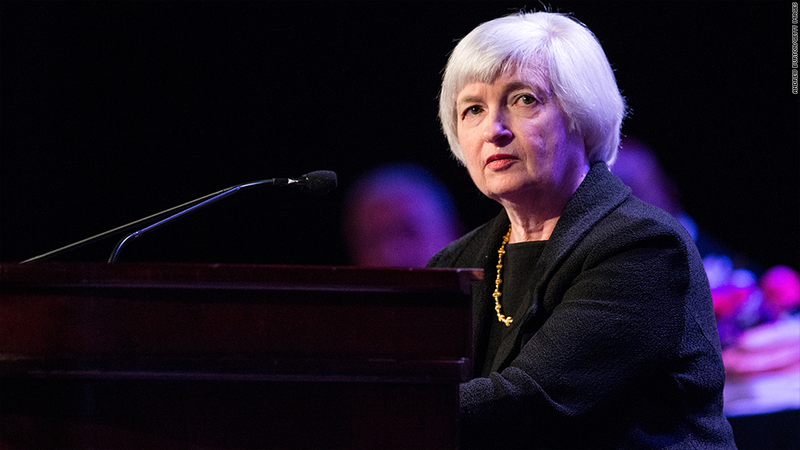 Lately, Yellen has mastered the art of subtlety, but everyone will be looking for hints. Will inflation surprise? Unemployment is 6.3%, still a fair amount higher than the 5.5% target the Fed has for "full employment". The other key indicator is inflation, and the latest data on that comes out Tuesday. Analysts expect the rate to fall from 2% to 1.8% annually. The Fed considers 2% the Goldilocks point for the economy. "If anything, what might surprise investors is the Fed expressing concern about the recovery's underlying strength," said Sal Guatieri, a senior economist at BMO Capital Markets. Because stocks are near all-time highs and bond yields remain low, any unexpectedly early changes in rates would likely cause a drop in stock prices and a rush into treasuries as bond investors flee to safer assets. Although the market knows low rates can't continue forever, timing is a big deal. Bank of England Governor Mark Carney added to the angst last week when he warned that the U.K. is likely to raise interest rates sooner than the markets expect. Unemployment is still elevated in the UK, and inflation is just under the central bank's target, but the country has red-hot housing bubble. Earnings: Four big names are reporting next week: Shipping giant FedEx (FDX), gun maker Smith & Wesson (SWHC), tech giant Oracle (ORCL) and BlackBerry (BBRY). Since shipping plays a role in many industries, FedEx's earnings are seen as an indicator of the rest of the economy. Many are forecasting increased sales and profits. Although gun sales are hot, analysts think Smith & Wesson's will fare well but not as stellar as last year. Wall Street thinks Oracle is going to be showing better profits and sales based on more businesses signing up to license its software. As for Blackberry, it's still sour. Expectations are that losses will double as the company continues to hemorrhage users. 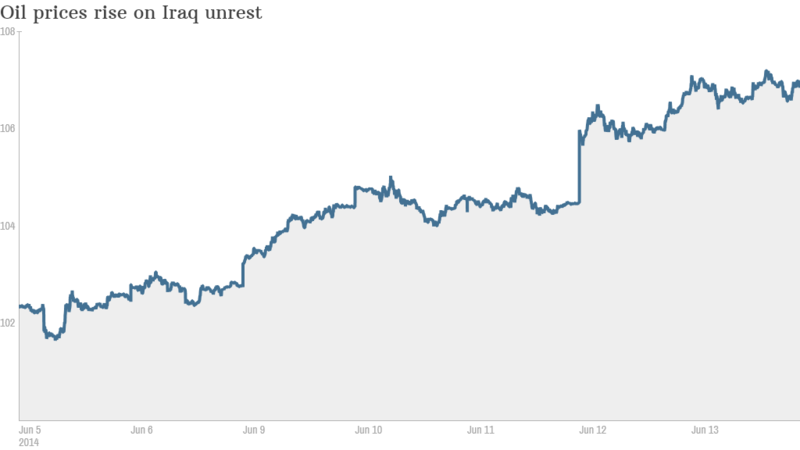 International Unrest: Iraq and Ukraine are back in the headlines. Iraq is under siege from a group of insurgents seeking to set up an Islamist state within the country, and they're knocking on Baghdad's door. President Barack Obama said Friday that the U.S. would not be sending in troops, although he did say America would offer assistance if asked through other channels. Oil prices were up 4% last week, and gold is also on the rise. The ongoing Ukraine conflict has also weighed on global markets. The World Bank lowered its global growth projections last week, citing in part the trouble in the country's eastern region as the reason why.